This Expert Advisor is based on two moving averages. The EA implements a self-training mode allowing it to immediately start trading. However, it is also possible to conduct a preliminary EA training for more efficient trading. By default, the EA is configured to work on EURUSD H1. 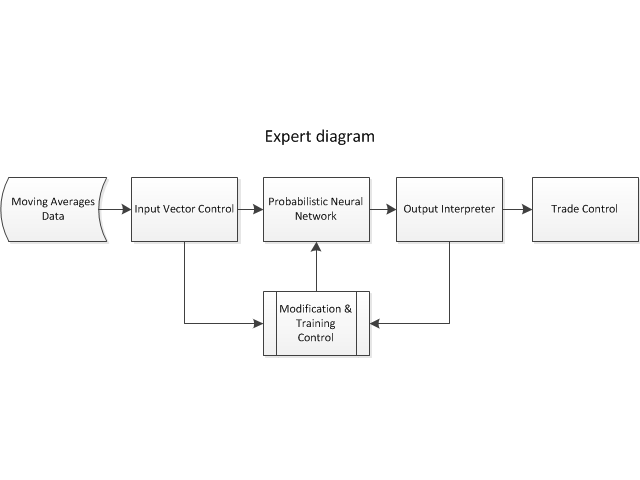 The robot is based on the modified probabilistic neural network. Initially, the neural network does not contain neurons. In this mode, the EA only learns. No trading is performed. In the course of the EA's work, it learns, and neurons responsible for one of the two classes (buy or sell) start forming in the neural network. As soon as there is at least one neuron, the EA can trade. TargetProfit, TargetLoss, TrailingStop - set stop loss, take profit and trailing stop levels in points. Applied to the symbol as a whole. VolumeLot - trade lot volume. Pause after trades, msec - pause after a trade in milliseconds. Number of trade attempt - number of attempts to enter the market. Adaptive_Moving_Average - adaptive moving average. Indicator first period - first moving average period. Indicator second period - second moving average period. Neuron activation level - neurons activation level. This is the minimum value of the network output, which affects the decision making. The recommended value is at least 0.95. Neural network signal duration, bars - neural network signal duration in bars. Neural network renewal period, days - neural network update period in days. Enable load neural network - load neural network data from the file. Prefix file name - set the file name for storing the neural network data. The file is created in the terminal's common folder in the Files\NNS directory. Select the testing and optimization periods, for example, the year of 2016 – for optimization period and 2017 – for the testing one. Launch optimization on the year of 2016. Once optimization is complete, select the appropriate results. When selecting results, adhere to the following recommendations: Indicator first period should be less than Indicator second period. Set other parameters at your discretion. Run a single test on the test period of 2017. If you are satisfied with the test results, then it is time to use the EA in trading. Set the Target profit level, Target loss level and Trailing stop level parameters at your discretion. Very interesting results with proper optimization of indicators (easy to do) and sound training of the neurons, huge potential so I'll begin to forward test. Lot of improvement since the beginning. 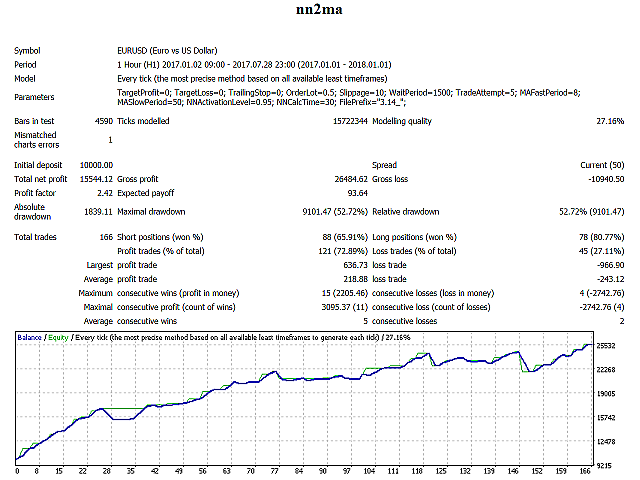 Hello Everyone, I've been using the EA now for 5 weeks on 3 different real life accounts with EURUSD 1H. I do not understand how that thing works but it's great. I hope that the EA will be able to make what he promised in the long run. A very complex EA if you use it from a VPS and optimize it on your computer, but in the forum they tell you how to do it. The results are very good, I have compared it with other neural network EEs and Nebula makes better input and output, risking less than other EA. Summarizing does his work very well. It can work on any currency pair as long as you optimize it to learn. The EA has some small shortcomings that the programmer says he will incorporate shortly. Having configured this EA and if these test results I have got from the beginning of the year (125% growth) are correct then this is a blistering EA. Well done Vladimir. 5 stars so far. Поставил бы ещё пять звёзд. Рекомендую. Разработчику спасибо и дальнейших успехов! The changes improve trading efficiency. 1. Simple moving averages are replaced by adaptive ones. This improves the quality of the neural network signals. 2. The neural network is calculated when a new bar is formed. Removed the "Neural network calc time, minutes" parameter. 3. Implemented the concept of the neural network signal duration in bars ("Neural network signal duration, bars". The neural network signal is considered confirmed if its duration is not less than the set value of the number of bars in this parameter. 4. Implemented the neural network update, in days ("Neural network renewal period, days"). All neurons having an age exceeding the parameter value are removed from the neural network.